Admissions Open at University of the Punjab's Quaid i Azam Campus (Main Campus), Allama Iqbal Campus (Old Campus), Gujranwala Campus (PUGC), Jhelum Campus (PUJC) and Khanspur Campus (Sir Syed Campus or Summer Campus) for the batch Fall 2018. PU offers admissions in different fields of study for Master and PHD Programs. 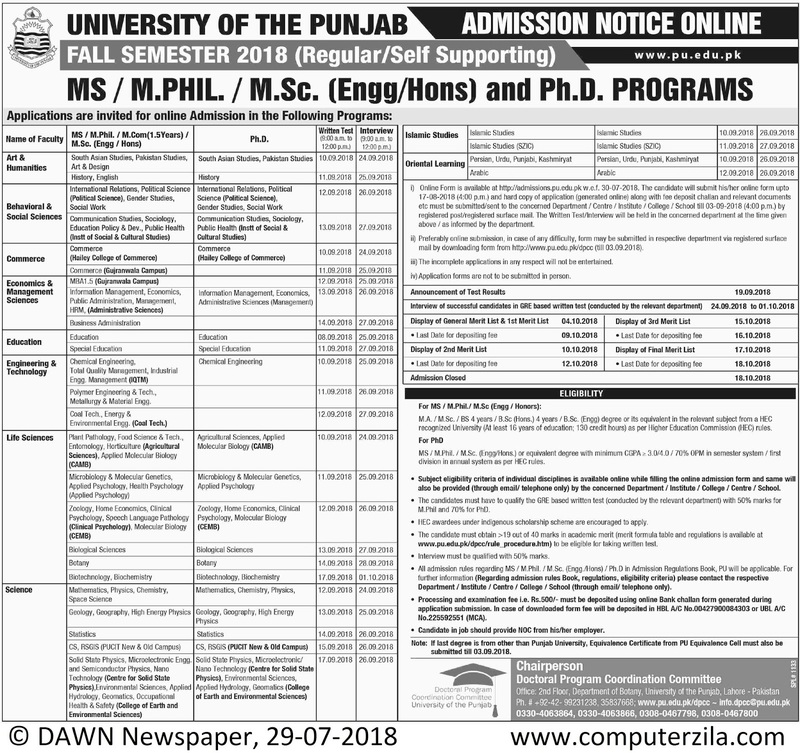 The University of The Punjab Admission Notice Online for Fall Semester 2018 (Regular and Self Supporting for MS / M.Phil. / M.Sc. (Engg/Hons) and Ph.D. Programs in following faculties. Arts & Humanities, Behavioral & Social Sciences, Commerce, Economics & Management, Education, Engineering & Technology, Life Sciences, Science, Islamic Studies and Oriental Learning Departments. University DescriptionEstablished in 1882 at Lahore, the University of the Punjab is the largest and the oldest seat of higher learning in Pakistan. It was the first to be established in the sub-continent in Muslim majority area. Campus AdressNear Ali Pur Chowk Rawalpindi Bypass, G.T. Road, Gujranwala.